Beneath the breakwater of the TYEE marina in Tacoma, lies a virtual bonanza of wrecks to dive, but only for the truly addicted wreck diver. 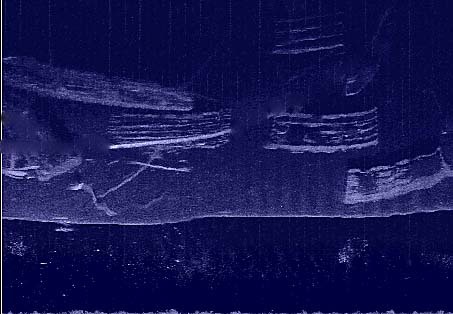 We counted seven barges, and three ship hulls lying on the bottom when we ran by with the side scan sonar (see below). Unfortunately, the wrecks below the breakwater are off limits to divers with BIG signs that warn you to keep 100' away from the future wrecks that make up this floating breakwater. However, if you head out away from the marina into the deeper water south of the marina, not too far from the barge storage area, you'll find plenty of diveable wrecks. My favorite is a large refrigeration ship sitting on a very steep slope. The ship measures 180' long via sonar, but the stern is actually buried in the silt at about 120' deep. It's a long swim from the stern to the bow, but the bow is very cool. It extends past the top of the hill it rests on, so the bow juts well out into green water, allowing divers to swim under the bow with plenty of room to spare. An old concrete section from the first Lake Washington Floating Bridge lies just west of the bow and partially underneath the refrigeration ship. Several large cargo holds are easy to drop down into, and you can still see the refrigeration piping and blowers that once kept the fish frozen on their way to the market. There is no superstructure left, and everything in this area is completely covered with several feet of very fine silt from the Puyallup river, so watch your fin technique and have a great dive. I should also warn you that this is a very busy commercial harbor, so watch out for tugs with barges, as well as a lot of traffic coming in and out of the marinas. The viz is typically very, very poor on the wrecks, almost as bad as Lake Washington, making navigation difficult and it is easy to stray into areas where you can't make a direct ascent to the surface (like under the barges or breakwater), so I would classify this is an advanced wreck dive, even though it really isn't that deep. With the many wrecks at this site covered with lots of silt and very poor viz, this dive is definitely not for everyone. There are several vessels laying on the bottom in the Northeast corner of Commencement Bay, including the gas scow TYEE (built in 1907, sank in 1927), the motor launch Arrow (sank in 1910 collision with the Celtic Monarch), the 73 ton Barge TYEE (sank in 1923) and the gas scow Nome (stranded in 1929). Sadly, they are slowly disappearing into the silt, making identifying which wreck is which anyone's guess. The Tyee breakwater itself is actually made up from old barges, hulls and the concrete pontoons from the first Lake Washington floating bridge. For information on diving the Tyee, please see Northwest Wreck Dives.